Dreaming with a broken heart. Waking up is the hardest part. To complete your viewing pleasure, watch this video together with this wallpaper. oh wow, finally a real wallpaper that i c looks amazing since people started to die in MT. nice work as well as ur video. really nice work - don't know the serie - but its really pretty. It's is a nice wallpaper you have here! I really like it, keep it up! very well done. I like what you've did with her eyes colour and the clothes, It gave to the scan some of your originality. Also, the background is very well done and goes well with the girl colours. the Building on the background are very rare on wallpapers, but you make them working fine with the image. nice shoot! nice wallpaper, the bg is well done, i like the scene. AHH! WHAT A PRETTY WALLPAPER! 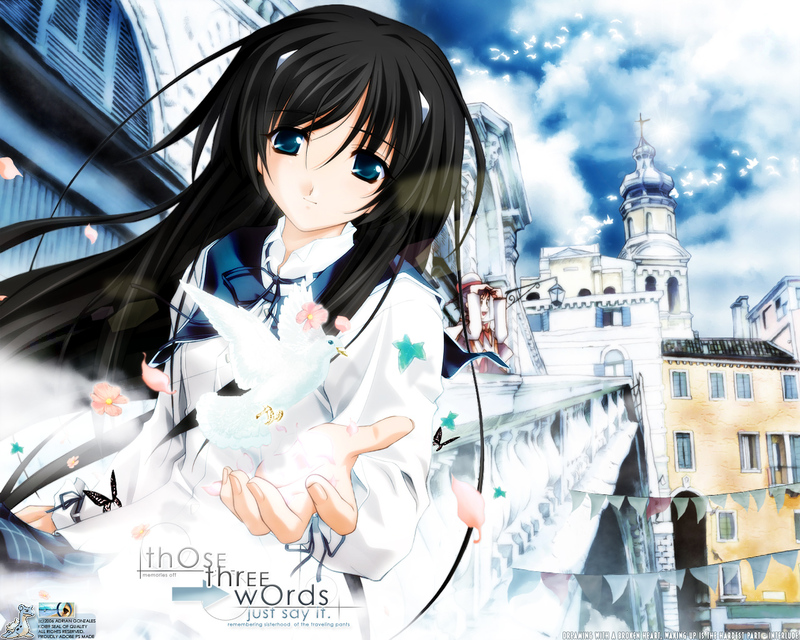 it looks good but the bg is from Aria is it...i can see a character from Aria behind her..
i like the dove from her hand.. I just love the colors! <3 <3 That scan has always been my fav from the start! ^^ The bg with all the buildings and willages are so kewl! >.< The shinyness of this wall makes me feel so happy! ^^ Loves from me! *adding to fav* Keep it up and thanks for sharing! ^^ I can't wait to see more from ya, Koi! Very impressive wallpaper, the camera angle and position of the character fit nicely and reflect the "mystic" mood perfectly. Awesome background! It looks so exotic and whimsical. There is a strong sense of feeling I get from this wall, so that's always the sign of amazing art! This wall is clean, crisp and has a very sweet and well portrayed theme. Awesome job! nice wallpaper and the girl is pretty! The glow and colors make it pleasant to view. Thanks! OMG! this is one of the BEST wallie i've ever SEEN! O.O"
The quality of the image and the bg..
"Yes, its true. I Love you!" great beautiful wall, new fav! I love it! The colors are wonderful and a great mix. It's calm and peaceful. I just thought it was a little random that there is another person in the background just behind her. It kinda took me by surprise. Haha.